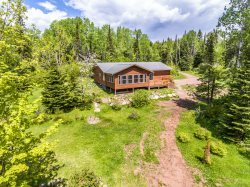 Enjoy this vacation rental that is located just a couple of blocks from Lake Superior and local businesses. Superior Overlook is a great and cozy place located in downtown Grand Marais. This home is within walking distance to the Grand Marais Marina, Artists Point, lighthouse and many local businesses. Comfortable furniture makes for an excellent place to gather with others. There is beautiful antique decor in the open and large living room area. The open living space is great for large groups and includes a dining area. The kitchen of this home opens to the living room area. Enjoy a full sized electric stove and dishwasher to help prepare your home cooked meals. This full kitchen opens to the dining and living room area. An additional room off the living room allows more space to relax. A great room for reading, relaxing or watching TV. The details in this home will continue to amaze you. The master bedroom off of the kitchen area on the main level has a king sized bed and access to a private bathroom. This is the first bathroom off of the main bedroom and features a shower and sink. There is plenty of room to get ready to explore the North Shore. Off of the living room you will access the first guest bedroom that contains a queen size bed. The unique decor of the first guest bedroom will make your stay pleasant. The retro decoration of this bathroom is magical. Bathroom features a shower/tub combo. The upper level features two bedrooms and one cute bathroom. Enjoy this place`s unique decoration and open spaces. The third bathroom is located in the upper level. The second guest bedroom features a queen sized bed. It has plenty light and a great view of the harbor. Enjoy the Lake Superior Views while you relax in this nice and cozy bedroom. This old-fashioned telephone will take you back in time. The third bedroom features a comfy and cozy king sized bed. Pretty vintage cottage bedroom with a lot of space for reading and relaxing. The sun room is a perfect spot to spend time with your family or friends. Enjoy a game night with your family and friends. There is room for everyone. Windows around all this room will give you views of Lake Superior and Grand Marais. The laundry area is located off the back yard entrance and is available for guest usage. This house has yard for games and activities. There is a gas grill for a summer cook-outs and patio area to enjoy the nice weather. This beautiful and old-fashioned home is an extraordinary place for big families. With comfortable furniture and well thought out decor throughout the house, it's easy to feel like you're walking into your own home. From the beautiful antique phones to chandeliers and candelabras, little details throughout the house will continue to catch your attention throughout your stay. The home has four well-furnished bedrooms and two and a half baths. There are many areas in the home to relax and unwind, including a sunroom with large windows offering great views of the Grand Marais harbor. Should you choose to stay in, a full kitchen allows for wonderful home cooked meals. Because this house is located right in Grand Marais, it is easy to come and go for food or shopping as you like. Or, since it's only a short walk away, go to the harbor to watch the sunrise or spend the afternoon watching the waves crash into the breakwall near Artists Point. Grand Marais is also within close distance of many outdoor and recreational activities including state parks (Cascade Falls or Judge CR Magney) and mountain bike and cross country ski trails (Pincushion Mountain). Fires are not allowed. No firepit. Everything went through internet...all worked well! OMG! I don't know where to begin! The location is fabulous! Within walking distance to town! Superior Overlook was well-equipped, clean, and welcoming. Early mornings and later evenings were spent in the large sunroom. What a great addition to this home/rental. Team is wonderful to work with. Great location, we loved being able to park the car and walk to town. The house was very clean and felt like home. Loved all the antiques, dishes and the way it was decorated. My husband and I would definitely rent this house again. All done via email. No issues. Great location for a good price! We thoroughly enjoyed our stay! Everything was clean, the space was cozy and there was plenty of room for our family of eight. My only complaints are that there are no shades on the windows upstairs, and thanking care of our own garbage on a Sunday was ridiculous. Kids had garbage bags on their laps until we could find the proper place to dispose of it. There needs to be something closer and more accessible.